The Express Triple Tote is a great option for a bowler who travels and likes to travel light. There isn't a space for shoes in this bag but it conveniently shows which balls are coming with you on the trip. Also this bag is lightweight making it great for airline travel. I use this as my second bag for a 6-ball arsenal. It's a decent bag. Doesn't roll real well; I usually end up carrying it. The zipper is junk; it broke after about a month of use. 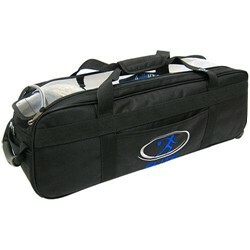 I added this bag to up to a six ball arsenal for league and tournaments. the first trip to a tounament the bag rolled 2 times in the trunck. I just got back from Reno and the bags zipp did not hold up to shipping. they were week to begin with before my trip. Of course I am out of warrenty and had to shell out $20 to get it fixed! To my fellow bowlers stay away from this tote! nice and very useful for traveling. I bought it because i was traveling and it was the best way to cary the balls. Due to the time it takes to produce the Elite Express Triple Tote/Roller Black ball it will ship in immediately. We cannot ship this ball outside the United States.